A staple around the festsive period is the Christmas jumper. If you don't have a Christmas jumper day where you work have you even lived? We have one every year and I have got into the habit of buying a new jumper to mark the occasion. 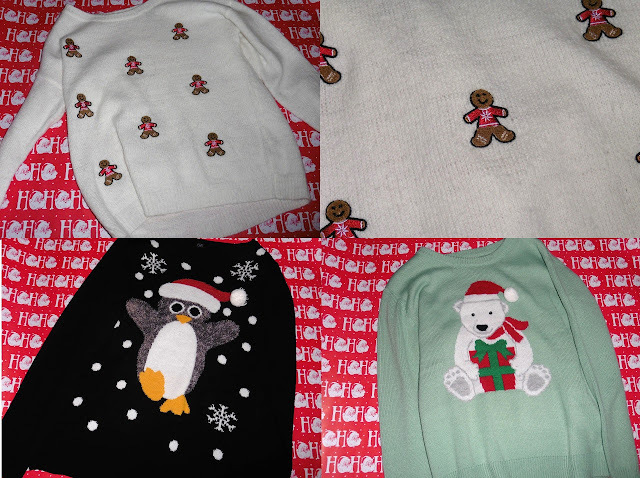 These are the Christmas jumpers I currently own I'm definitely a fan of the cutesy ones and the festive animals. The gingerbread man one and the polar bear one are from Primark (they do some bargain festive jumpers) and the penguin one is from Tesco's. I'm such a fan of Christmas jumpers and I think it has to be obvious what they are these subtle winter pattern ones do not count! There's just something about wearing a Christmas jumper that gets you into the festive spirit. What type of Christmas jumper do you normally go for?